Thomas Cook Airlines Boeing 757-200. Photo: © Lasse B.
British leisure airline Thomas Cook Airlines will retire the last of its Boeing 757 fleet in the first quarter of 2019. Thomas Cook Airlines currently operate a fleet of two Boeing 757-300, the stretched variant of the venerable 757-200. The airline previously operated the Boeing 757-200, retiring them in 2016 and replacing them with Airbus A321 aircraft; a trend which can be seen across the industry as the 757 ages. 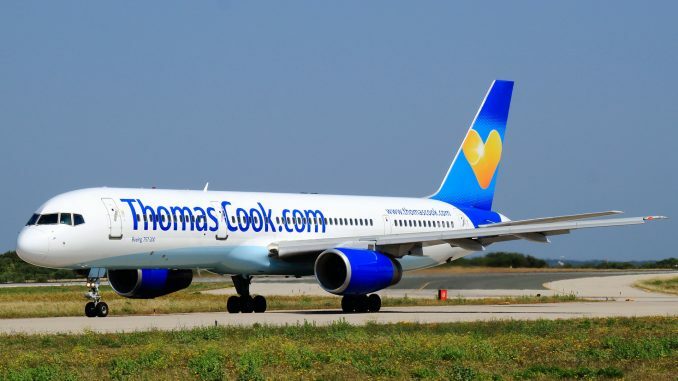 Manchester based Thomas Cook will transfer the aircraft to its German sister airline, Condor, as it looks to expand. Condor was the launch customer for the 757-300 when it received its first of the type in 1999. 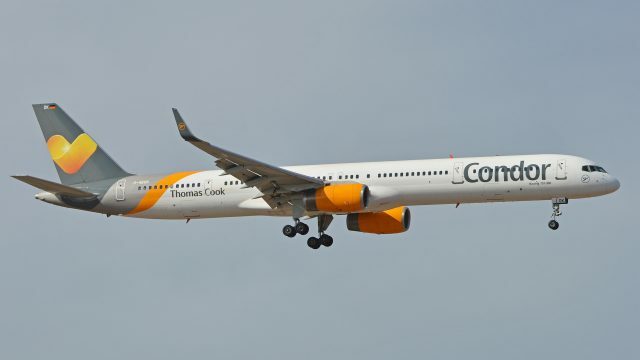 Operating mostly from Frankfurt, Condor currently has a fleet of 13 Boeing 757-300, having also previously operated the Boeing 757-200 between 1990 and 2006. The Boeing 757 was designed to replace the 727, and first entered service in 1983 with Eastern Air Lines in the United States and British Airways in Europe. The final 757 was delivered to Shanghai Airlines in 2005. As the global fleet ages, many airlines are retiring the 757 despite the lack of a replacement aircraft. The Airbus A321neo/A321LR is the closest to a replacement in terms of range and capacity. On short haul, most airlines, including Thomas Cook, use the Airbus A321 as a replacement for old 757-200s. The Boeing 757-200 carries approximately 220 passengers over 3,900 nautical miles (7,250 km). The stretched 757-300, which is the longest single aisle aircraft in the world, carries 280 passengers up to 3,400 nautical miles (6,295 km). Of the 1,049 Boeing 757s built, only 55 were of the -300 model. Many passenger 757-200s are seeing a second life as cargo aircraft with the likes of DHL and FedEx, and it is still hugely popular for its unrivalled performance. The 757 remains the airliner with the highest power-to-weight ratio, giving it excellent short field and hot & high performance. Its relatively long range with conservative capacity makes it perfect for long, thin routes where demand is lower than the requirements of a wide body aircraft. It is heavily rumoured that Boeing is working on a direct replacement for the 757, and that it will be named the 797, but there are yet to be any official announcements.